This is a great opportunity to share more details on pain points for tablet users and how to have a painless tablet experience. Whether they be physically, psychologically, or economically related, all of us have a different pain points. This time we’ll focus on some physical pain scenarios. Text Neck & Eye Strain: Users at any age can experience text neck or eye strain. In our last blog article titled “Technology Accessible To Everyone,” an illustration which diagramed an adult human head weighing 10-12 lbs will have an impact of weighing 40 lbs when the head is tilted downward at a 30 degree angle. That’s significant for anyone, and a common concern for parents with children using these devices in their early physical development years. TORCHGRIP® provides a solution by allowing the user to stand the tablet at the appropriate angle to facilitate proper posture. It also provides the option to stand the tablet in portrait or landscape orientation, and allows you to adjust the pitch or angle of the device while resting on most surfaces. TORCHGRIP® does this by allowing the accessory grip to freely rotate 360° with just the right amount of resistance, while the base remains fixed to the tablet. The added benefit of being able to eliminate glare or light reflection on the display, reduces eye strain to the tablet user. 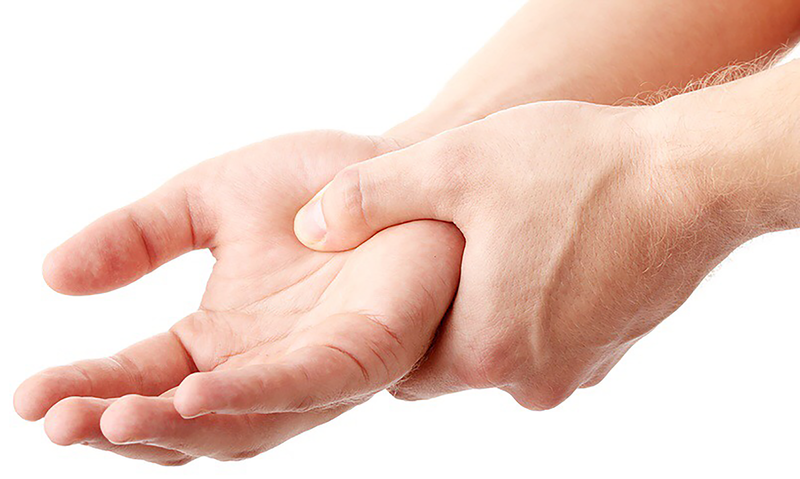 Hand, Wrist, Arm & Shoulder Pain: We also spoke of a user suffering from Rheumatoid Arthritis (RA) and how common tasks such as performing a web search, reading an email, playing solitaire while holding a tablet, etc. should be easier. But instead, holding a tablet by the thin edge can cause muscular cramping between the thumb, index finger and palm. 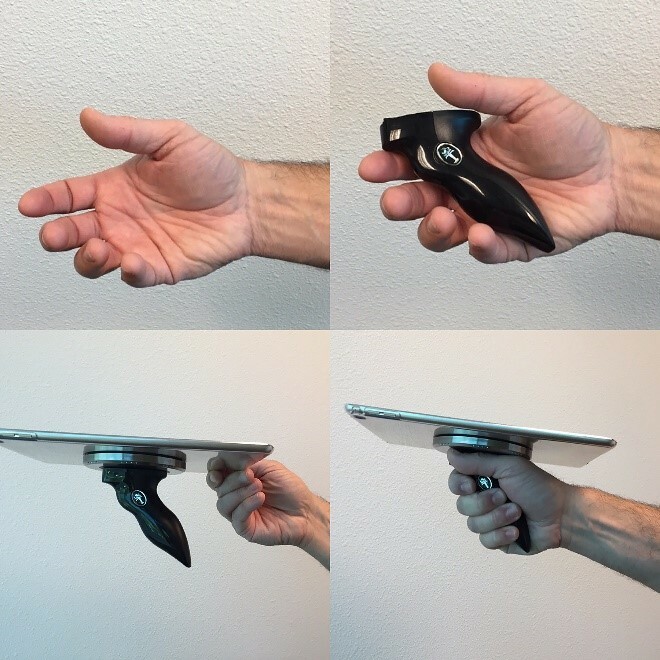 TORCHGRIP® resolves this best, by enabling the user to comfortably hold the tablet balanced over a naturally closed hand when standing, sitting, sharing, or transporting it from one room or location to the next. Your Posture & Freedom of Movement: Let’s face it, everyone has a different body size and shape therefor a different sense of comfort and list of needs when dealing with their own posture or unique anatomy. This is exactly where TORCHGRIP® is the most beneficial to the user. It provides the greatest level of comfort and security as a tablet handle, and simultaneously provides the most freedom and stability as a tablet stand. Muscular Strain and Device Weight: TORCHGRIP® is extremely light weight. And because it’s fixed to the balanced center of the tablet back or tablet case when mounted, it provides a sensation of reduced weight and strain. The user no longer must hold the tablet by the edge or border which causes unnecessary twisting to the hand, wrist, and arm. The advantage of holding a tablet comfortably and securely in one hand using TORCHGRIP® becomes obvious when shaking the hand of someone else you’re greeting, or when holding a tablet in one hand and opening a door with the other. Carrying or lifting other objects while holding a tablet are some real-life scenarios that everyone and especially parents and grandparents alike can relate to. For more detailed information, please read the article titled “Ergonomics 101” which was published on January 2, 2015, by Jack Benton of EHS Safety News America. We have experienced several of the health hazards of tablet use discussed in the article and we designed the TORCHGRIP® tablet accessory to help you ergonomically use your tablet. We can go on-and-on listing lifestyle situations which would cause pain, frustration, awkwardness or even the possibility of dropping your tablet. The point we’re making is that everyone moves with a tablet, a device that was designed to be more than just a laptop computer. Tablets are picked up and set down again and again. We stand or prop them up, we hold them, we share, we create and we collaborate with them. And let’s not forget this, especially in this holiday season. We all don’t have equal physical ability to conduct our lives with sameness. So why not free a hand to help someone else? This product solution named TORCHGRIP® will enhance the way you stand, hold, share, and get creative with your tablet. You can see it and learn more by visiting www.torchgrip.com, Facebook, Twitter, Instagram & YouTube.